These beautiful marble planters add unique artistry to any home decor. Their classic and elegant shape is finely complimented by an unusual multicolored marble design. Contact us today for a customized quote,if you are looking for some to decor your garden or street Urgently,DO NOT HESITATION ! 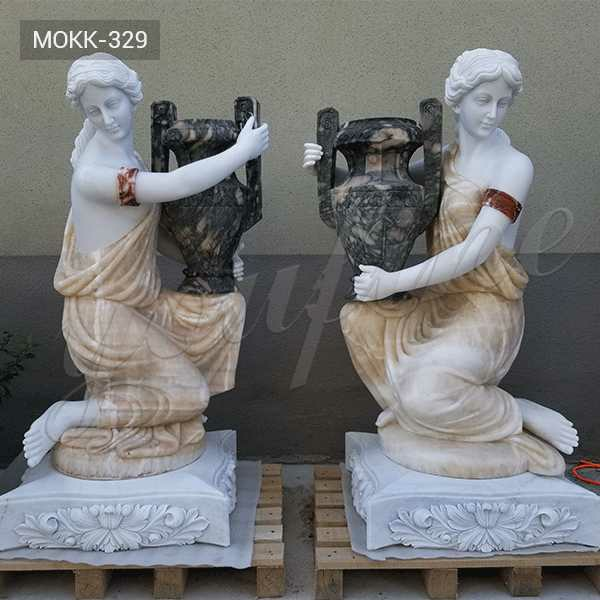 This Paired Beauty Lady Holding Planter is wonderfully decorated for your garden and yard square, which is engraved with 100% natural materials, granite, sandstone, limestone are also available.Each marble Paired Beauty Lady Holding Planter has been carefully designed and crafted by our professional sculptors.Customized design and size of your art sculpture in the marble garden. These beautiful marble Commercial Size Outdoor Planters are made from a spectacular combination of fine marbles including red and black. Large and elegant design, with deep basin for plenty of storage. Contact us today for more information. 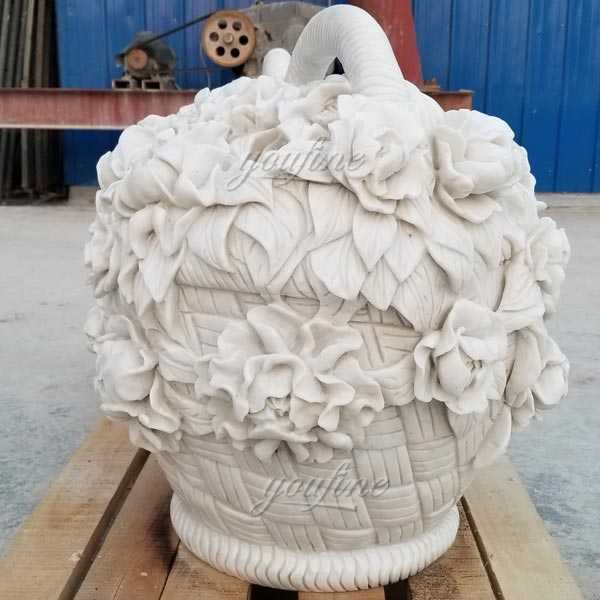 Looking for the perfect hand carved white marble stone flower basket ? You can stop your search and come to You Fine Art Sculpture, the marketplace where sellers around the world come here to search the creativity, handmade and vintage goods! With You Fine Art Sculpture, buyers like you can find hundreds or thousands of unique, affordable hand carved white marble stone flower basket! Let’s get started! Delivery Time:Small sculptures in 30 days usually. Huge sculptures will take more time. Typical height for inside or outside marble vases is 20 “to 36”. 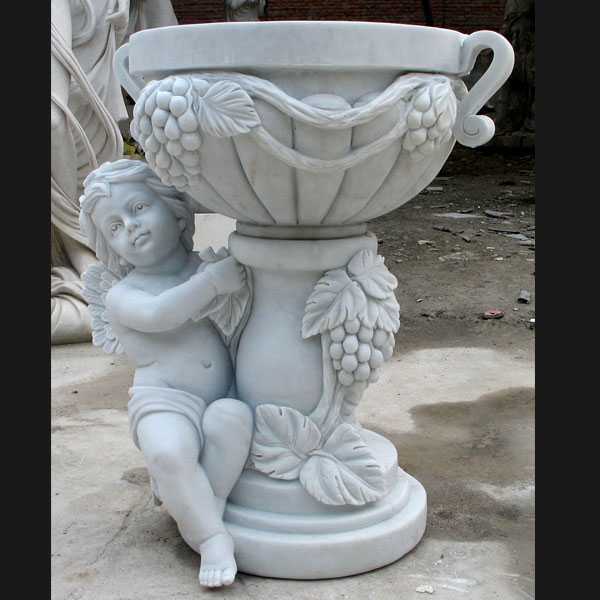 Each one of you fine art sculpture vase is hand carved in a single piece selected high quality marble by our experienced professional sculptors. 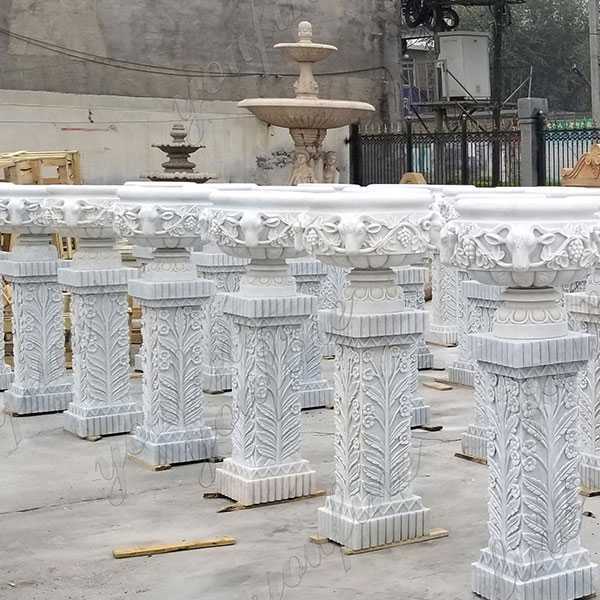 The Beijing white marble, which is near our caving facility is one of the most popular choices for marble vases. Evening cloud of red marble, which also from the same region has been increasingly favored in the market. 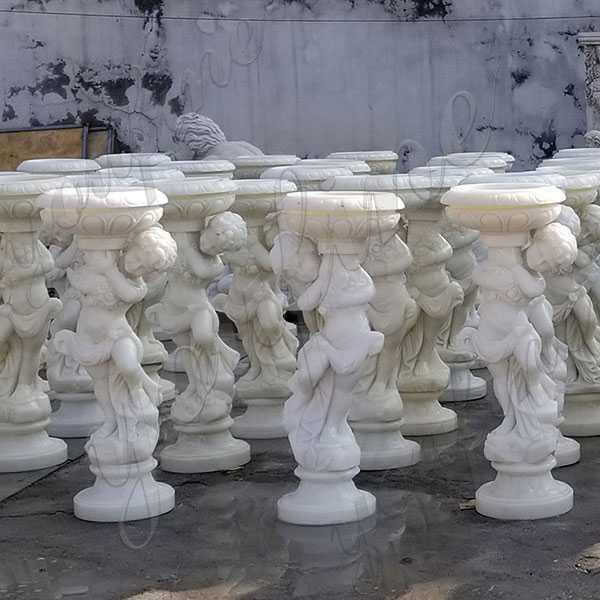 Characteristic : this marble looks soft luster and suitable to make any carving. You Fine Art Sculpture is the ultimate source for all your marble and other natural stone needs. 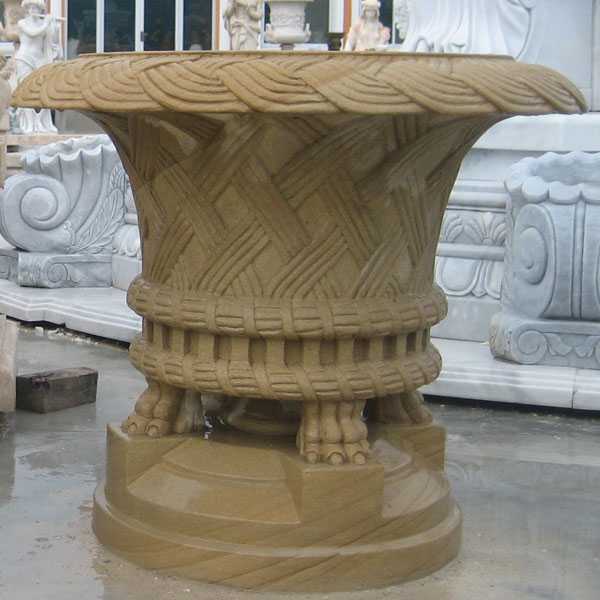 You Fine Art Sculpture design, manufacture,export a full line of carved stone, decorative stone, building stone and other stone products worldwide and has emerged as a leading supplier for major architectural stone projects including hotels, condominiums, commercial buildings, and residential constructions. The surface of the stone planters can be finished in different ways. The most common one is “polished” that emphasizes the colors and veins. Polished is also a popular choice that seems less. If you do not want color variations or veins of natural stone to stand out, you can choose something called the “Rough” or “Antiqued” finish. 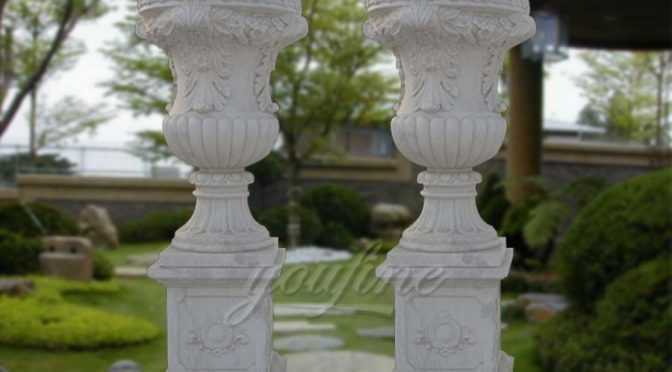 Remarks:You Fine Art Sculpture supplies garden ornaments as fountain, flower pots, gazebo, table and bench etc. We suppliy differnt styles and sizes. 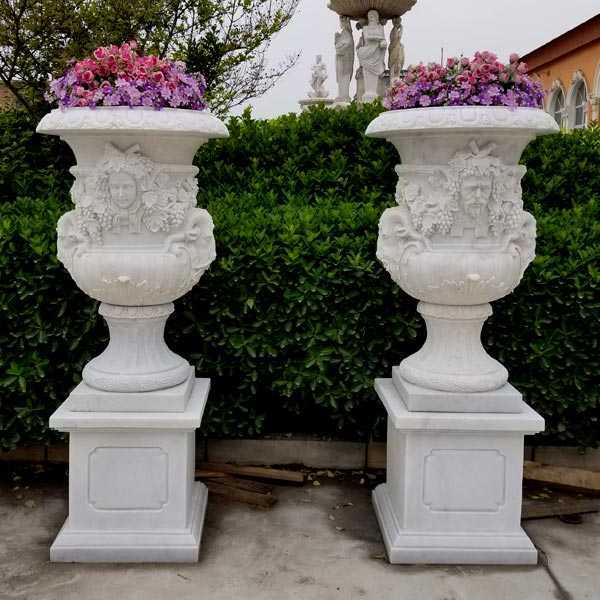 If you are interested in our outdoor garden pots planter decorative marble planters or other products, please contact us freely. Thanks! 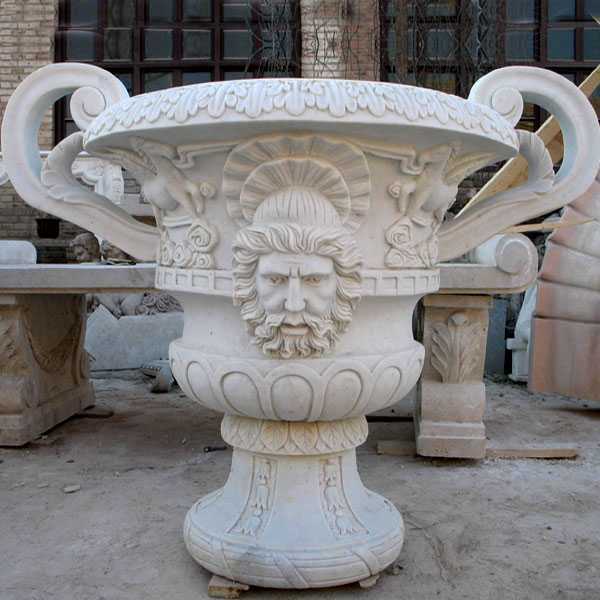 Each modern flowerpot and flowerpot have been carefully designed and carved by our professional sculptor. 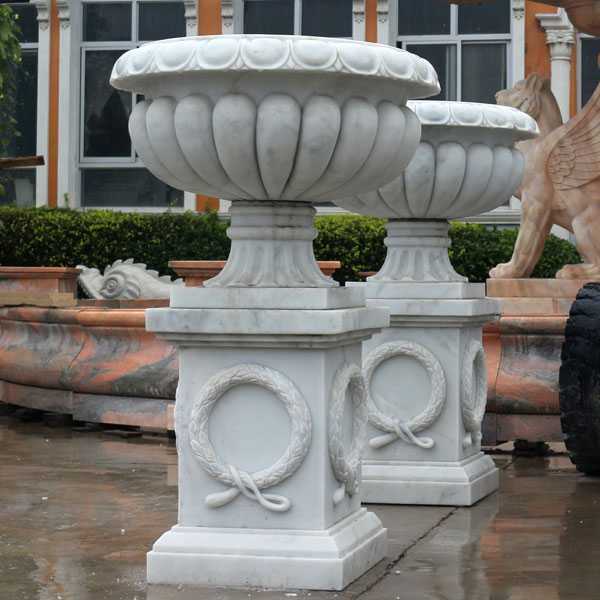 The value of the marble flowerpot will be preserved by its natural characteristics, durability and artistry. The marble flowerpot has various shapes-rectangular, square, round and oval. The marble flowerpot can be used indoors or outdoors and will make an impressive presentation. This is a splendid marble planter for a garden! The unusual earth tones blend wonderfully with natural outdoor colors, especially lush greenery. A wide assortment of colors and splattered-like design compliment the delicate shape. 1. All enquiries/questions will be replied within 24 hours. 2. All goods can be customized for you as your size and pattern. 3.Quality level including packing standard is the best and most stable. 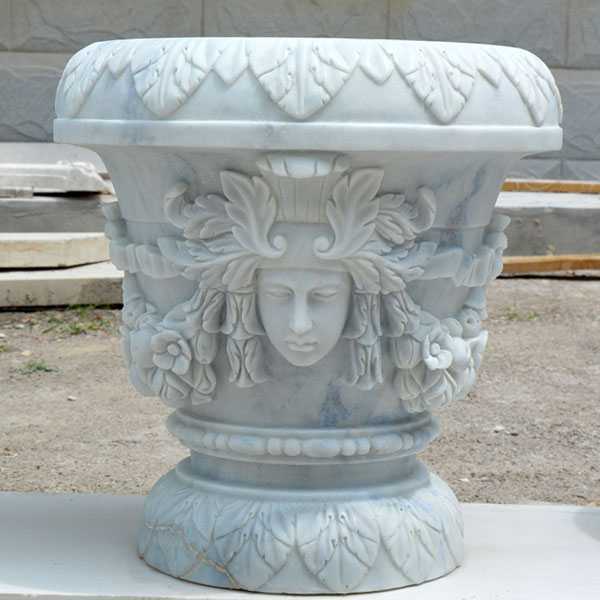 Beautiful all hand-sculpted white marble planter pot. We can custom design these to your exact requirements. These beautiful marble planters add unique artistry to any home decor. Their classic and elegant shape is finely complimented by an unusual multicolored marble design. Contact us today for a customized quote. 2.100% natural and high grade material. 3.A great deal of experience in marble carvings. 4.High quality and very detailed workmanship. Planter, often being called flower pot and garden vase, always serves as an decoration while planting a live plant or small tree. 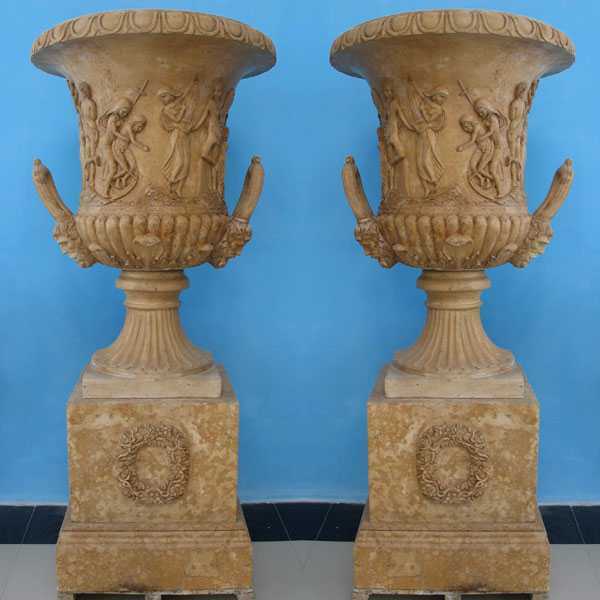 Marble Planters or other type of stone flower pots make such decoration more enhanced and attractive. This decorative little planter outdoor flower pots with double ears garden pots adds beauty and joy to your home’s interior.show your elegant taste! 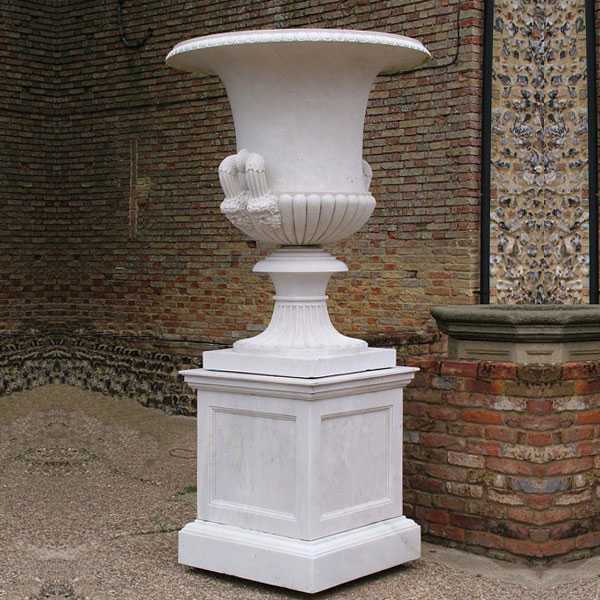 Very fashionable with the timeless sophistication of white marble, this urn planter is perfect for a balcony, patio, or garden. The gorgeous shape is complimented by meticulous detail hand carved around the edges. This is a splendid marble planter for a garden! The unusual earth tones blend wonderfully with natural outdoor colors, especially lush greenery. 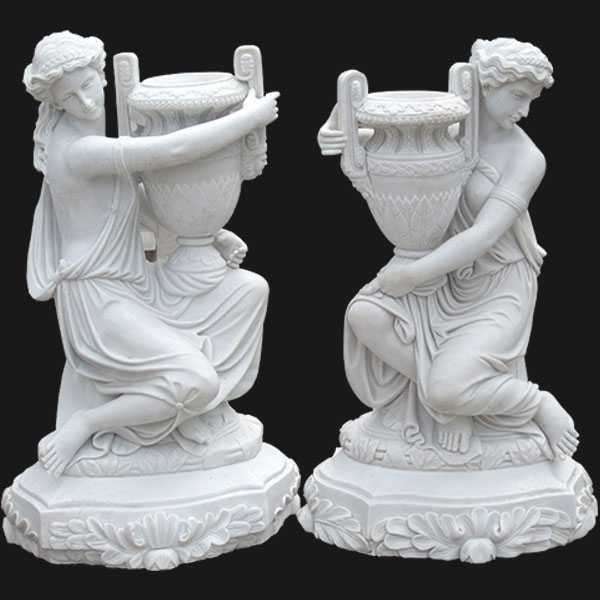 This pair of is wonderful ornament for your garden&yard plaza place,which is carving of 100% natural material.Admire the pure elegance of this wonderful marble planter!Delicate and finely crafted artistry makes this a stunning piece to display.Contact us today for sales assistance and customization details. 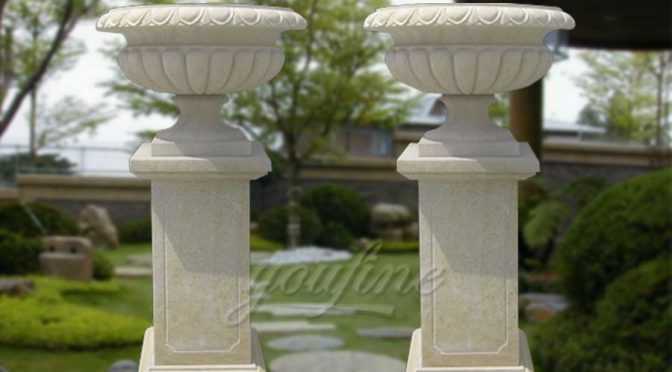 This pair of is wonderful ornament for your garden&yard plaza place,which is carving of 100% natural material, granite,sandstone,limestone is also available. All of the is full hand carved,high polished of the surface. 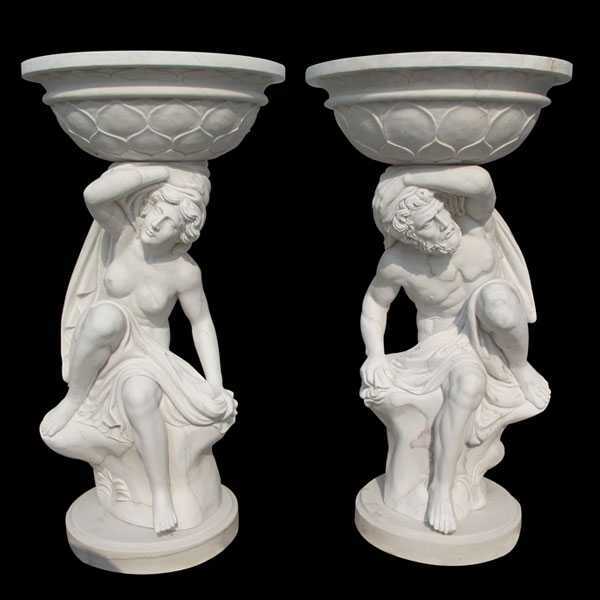 You Fine Art Sculpture off bespoke design and size for the marble garden planters. 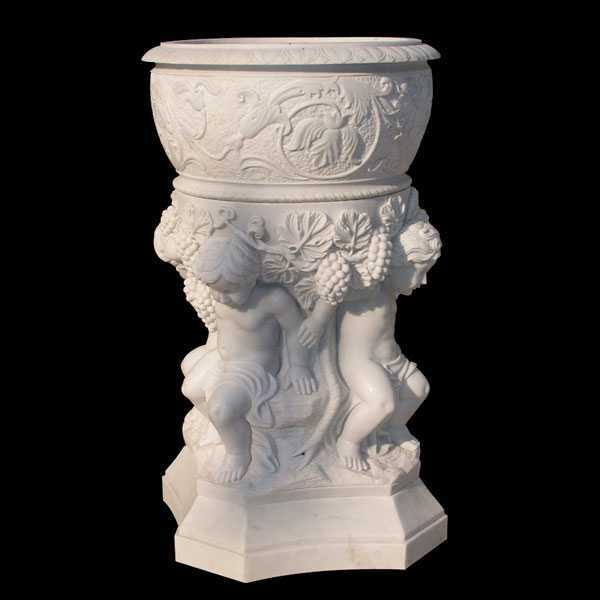 A beautiful bouquet of roses is hand carved into the surface of this enchanting marble planter. Made from pristine white marble, this piece also features realistic sculpted leaf decor and an elegant deep bowl urn shape. A terrific accent for the garden. 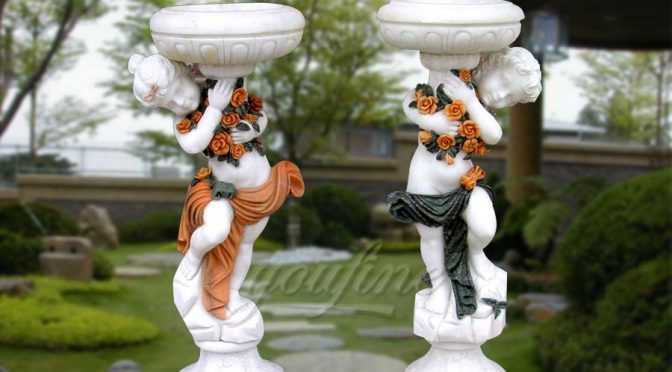 Remarks:You Fine Art Sculpture supplies garden ornaments as fountain, flower pots, gazebo, table and bench etc. We suppliy differnt styles and sizes. If you are interested in our outdoor garden pots planter dcorative marble planters or other products, please contact us freely. Thanks! Each You Fine Art Sculpture marble vase is hand-carved by our experienced professional sculptor in a selected high-grade marble. Beijing Black and white marble, collected near our cave factory, is one of the most popular choices for marble vases. 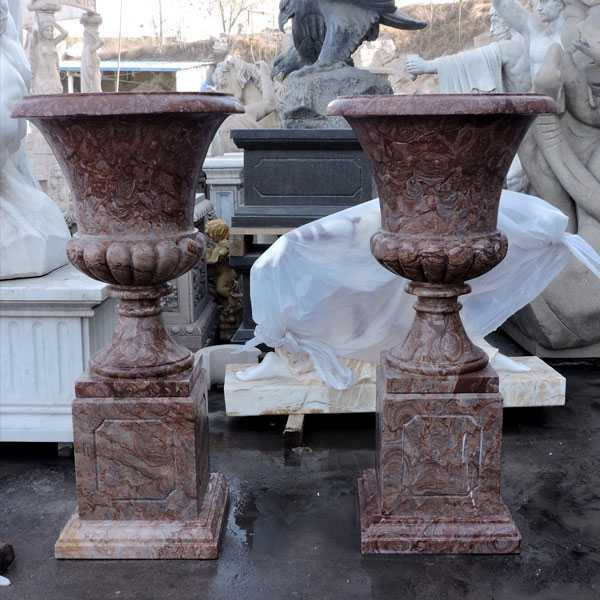 The dark red marble from the same area is becoming more and more popular in the market. 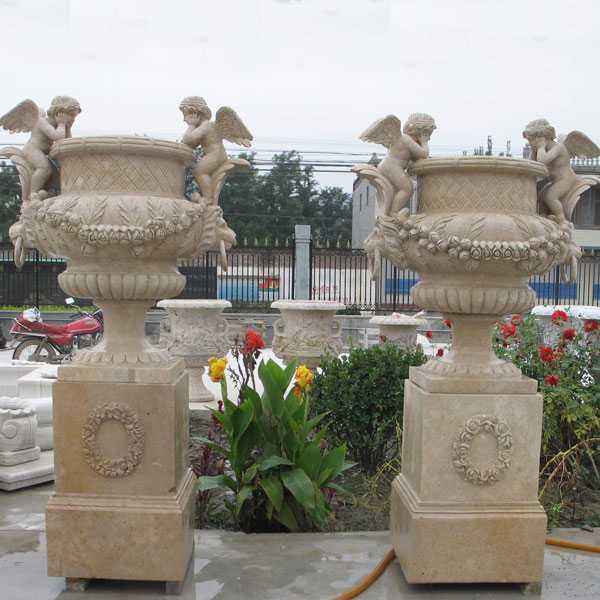 Each marble stone Flower Pot is carefully designed and carved by our professional engraver. 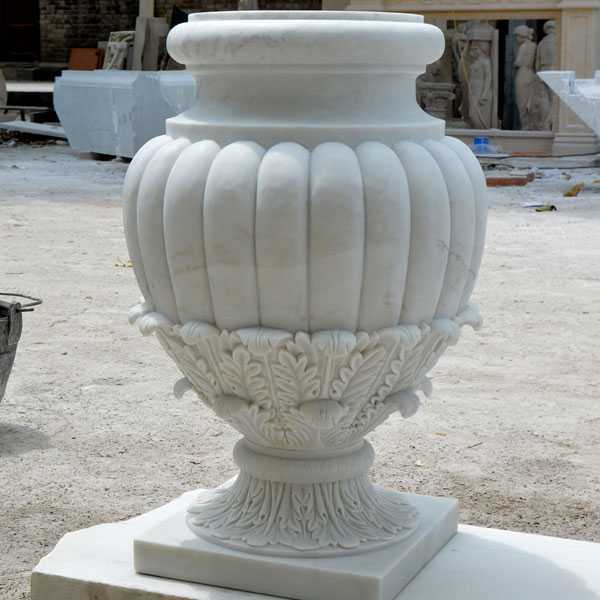 The value of the marble flowerpot will be preserved by its natural characteristics, durability and artistry. The marble flowerpot has various shapes-rectangular, square, round and oval. Size：H: 55” or Customized Size. Package&shipping: Strong Wooden Case,By sea shipping,any special requirement,please inform us. Size：H: 67” or Customized Size.